Home Secretary John Reid has called for a mature debate on the immigration challenges facing Britain. Mr Reid said: "We have to get away from this daft so-called politically correct notion that anybody who wants to talk about immigration is somehow a racist." The skills migrants contributed had to be weighed against the burden placed on schools and hospitals, he told the BBC. Mr Reid also highlighted his proposal for an independent committee to advise on the optimum level of immigration. The independent body would prevent the issue being used as a "party political football" and would provide a clear indication that the government was listening to public concerns, he said. The Home Secretary also defended the government's decision to allow people from new European Union states to work in the UK. 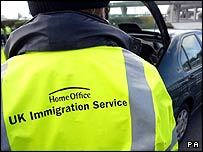 According to latest government figures, 374,555 from the eight nations - including 228,235 Poles - registered for work here between May 2004 and the end of March this year. Mr Reid stopped short of saying whether similar rights to settle and work would be granted to would-be migrants from Romania and Bulgaria when they join the EU next year. Reports have suggested that he is wary of allowing free access to the UK job market to workers from these two states. But Mr Reid said: "People recognise that others from outside this country can bring great skills here, but they also want to be assured that our services - whether it's schools or hospitals - and indeed their own terms and conditions will be preserved and immigration will be managed." He went on: "I don't accept that there's this unmanaged tide, but I do accept that people want reassurance that when we are allowing people to come to this country, they contribute something towards it." Challenged on BBC News 24 about the numbers of illegal immigrants currently in the UK, Mr Reid admitted that he did not have an accurate figure. "What I do know is this: We have to give the Immigration and Nationality Directorate more power to manage on a long-term basis. We have to enforce our borders better, and I am bringing in means of doing that, doubling the enforcing regime." Shadow home secretary David Davis said: "It is welcome that John Reid is finally acknowledging what we have been telling the government for some time now, but he should realise that the British public expect real action, not just more spin and bluster. He added: "The Home Secretary should not transfer responsibility for the level of immigration to a migration committee merely to duck accountability on the issue. Whatever the recommendations of the committee, the Home Secretary must remain accountable." In an address to think tank Demos on Wednesday, Mr Reid is expected to say mass migration in a globalised world is the "greatest challenge facing European governments". He will say that the Cold War froze the world into a static state but that now that had changed, in part due to "porous borders", "failed states" and "affordable transportation". "There is greater potential to create wealth and expand opportunities, but the volume and speed of movements can also carry insecurity into the heart of our communities," he will say. Sir Andrew Green, chairman of Migration Watch UK, said: "We welcome a mature discussion and particularly the concept of an optimum level of immigration which also, of course, implies some limit."